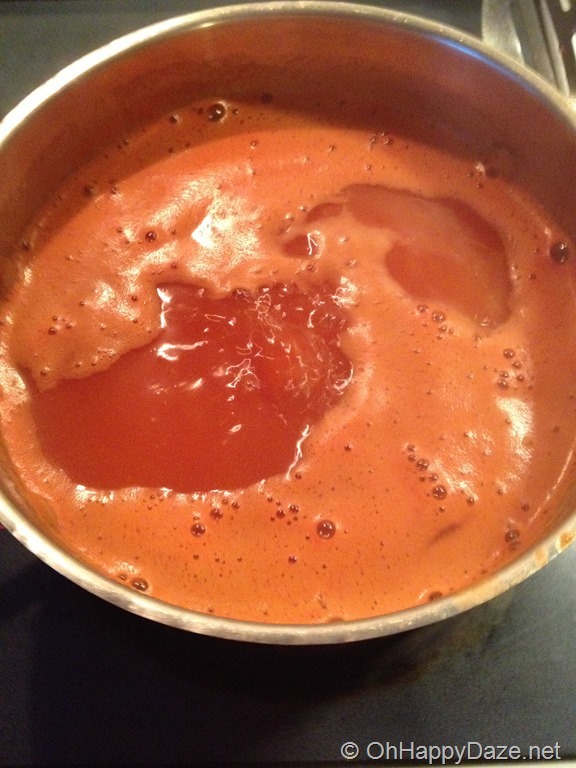 Homemade Tomato Sauce – Is it worth it? I can’t say I actually “like” homesteading, although I believe it is the way to go with the world as it is today. I tend to be on the slightly lazy side and lets be honest, homesteading is hard work! 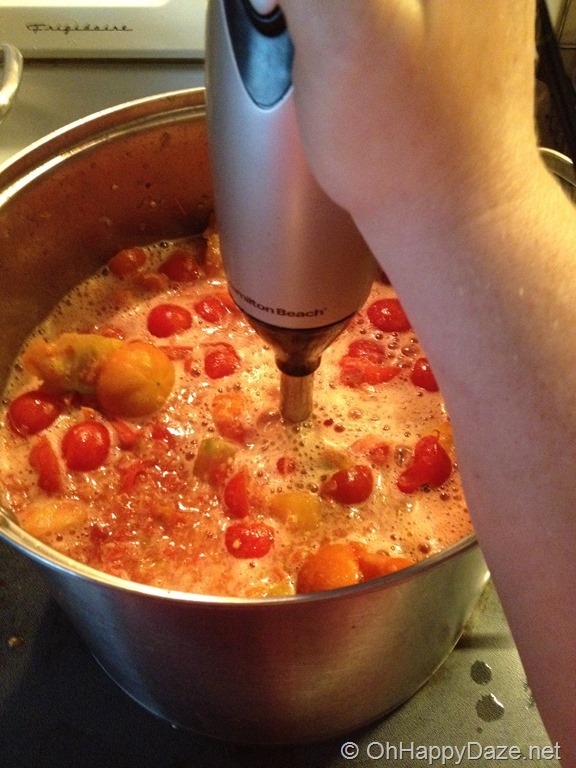 I try my best and my hubby loves it when I am in the kitchen canning and blanching, juicing and chopping, slicing and dicing. But if I were to just be blatantly honest… my modern woman laziness influences my mindset fairly often. So let’s think about all the work that goes into making these beautiful red luscious juicy tomatoes into a jar of sauce. First, of course, you have to grow them which means you have to till the soil, plant the seeds (or plants), tie them up, pull the weeds around them, add fertilizer, keep the tomato horn worms off (usually by hand plucking them off and tossing them to the nearby chickens.) All this “fun” stuff, my hubby does. It is after all of that when I have to do something with them. All his hard work (which ironically he LOVES to do) makes me feel pretty obligated to do “my part” of the job when harvest time comes. Seriously, what kind of wifey would I be if I just sat there and let all of his hard work go to rot because I refused to preserve the food? SO, what exactly does “my part” include? 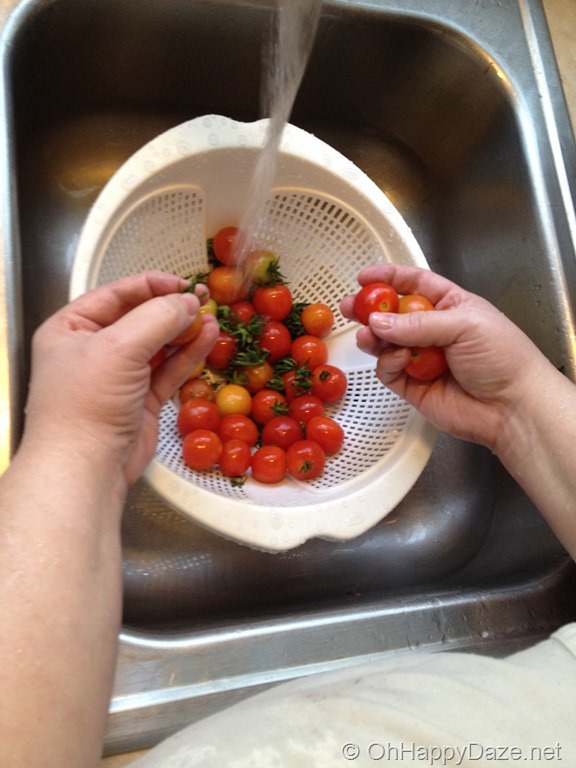 After picking the tomatoes (which is our kid’s job), I have to wash them and “de-stem” them, which is not so bad, I just rub the stem of the little ones and the green stuff pops right off. The bigger ones have to be twisted off, but still not to bad. Then I have to cut them up into my “big ol’ pot” to cook. This is messy and takes some time. I tried to save time cutting multiple small tomatoes at a time. That helped a little but I had to be careful not to cut my hand, thankfully I used my ceramic knife which isn’t as mean as my stainless steal ones. 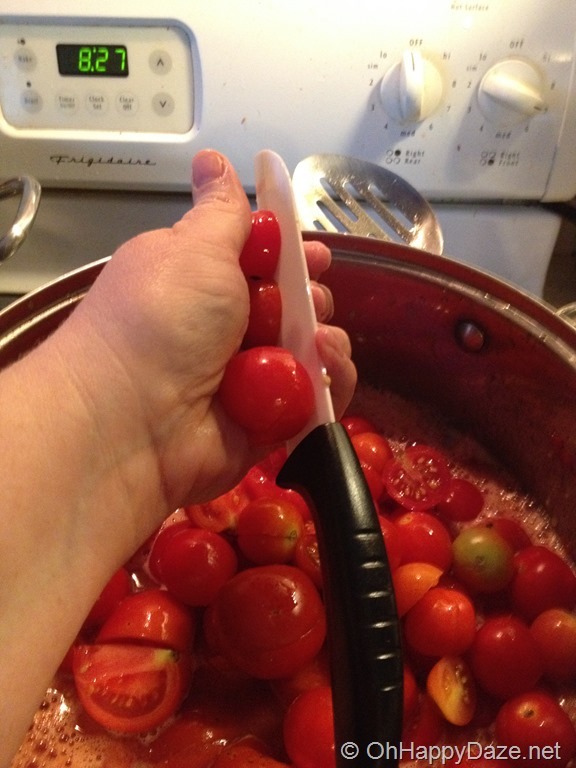 The big tomatoes were real fun, they would send a cascade of tomato juice running down my arm all the way to my elbow each time I cut them (I’m short). 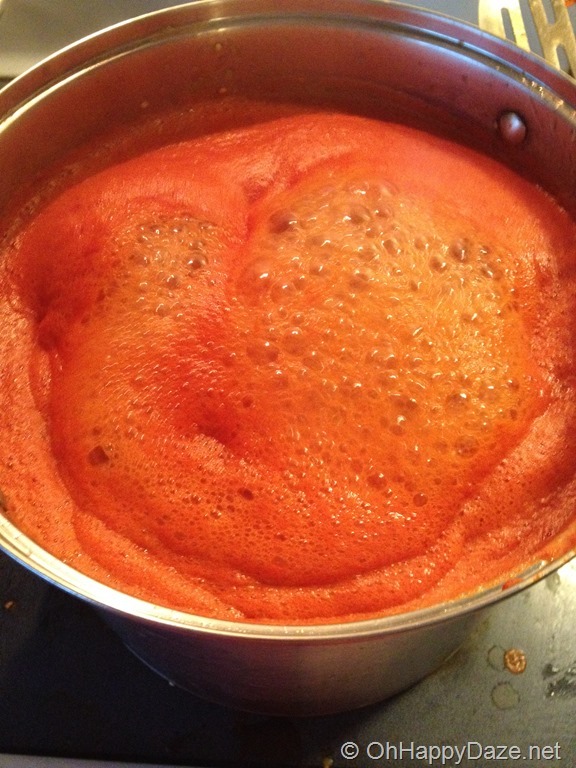 In no time we have frothy boiling tomato juice! The book says to cook for 10 minutes to get the juice out, at this point it’s probably not really necessary because it has been blended and about to go in my strainer but I let it boil a while. I guess I was just having a moment of obedience. Next, I let it cool a little and then start running it through my Roma Food Strainer. 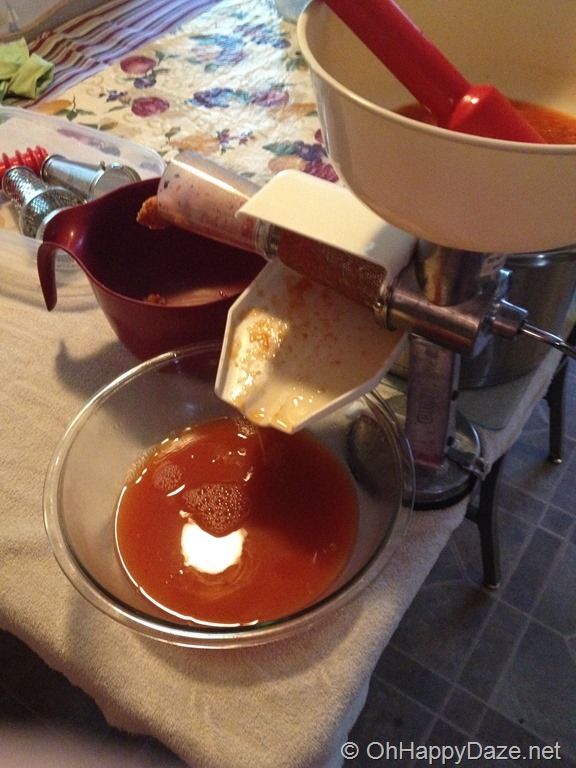 Juice comes out one end and … goo, consisting of seeds & skins and pulp, comes out the other. Warning: Plunging the red plunger down hastily because you are impatient, causes the juice to come out of the strainer screen part in super soaker style aimed right at your face.. and it’s still hot! And when it was all said and done, I had 9 pints of thin tomato sauce. Which probably would cost about $25 for organic tomato sauce at a store. 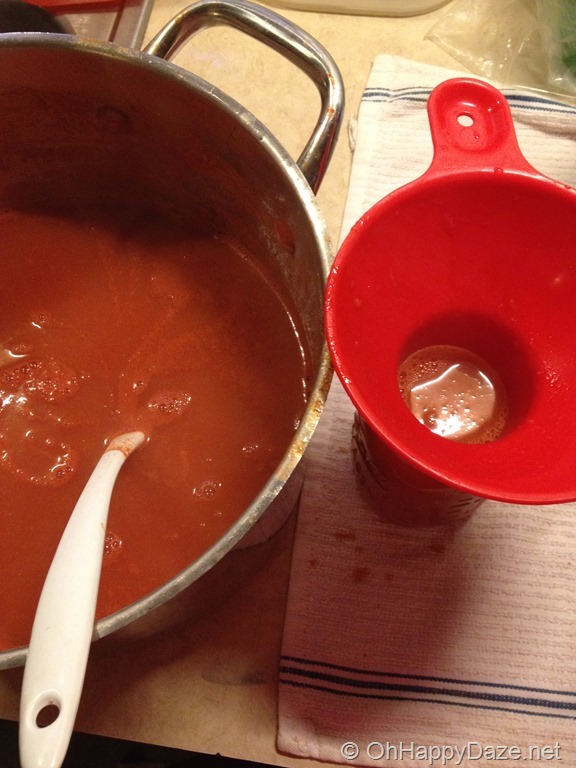 I would say it isn’t worth it, the time, the mess, the burns … all for 9 pints of tomato sauce. It would have been much easier to just grab a can from the store and move on with my day… But after the job is done and I look at my little jars all lined up on my counter there is a great sense of pride knowing the hard work went into those jars. I know where it came from, what is in them, how it was processed, when it was canned, and that it was done with tons of love and hard work! I know it is truly organic, non-GMO, Kosher, and farm raised! 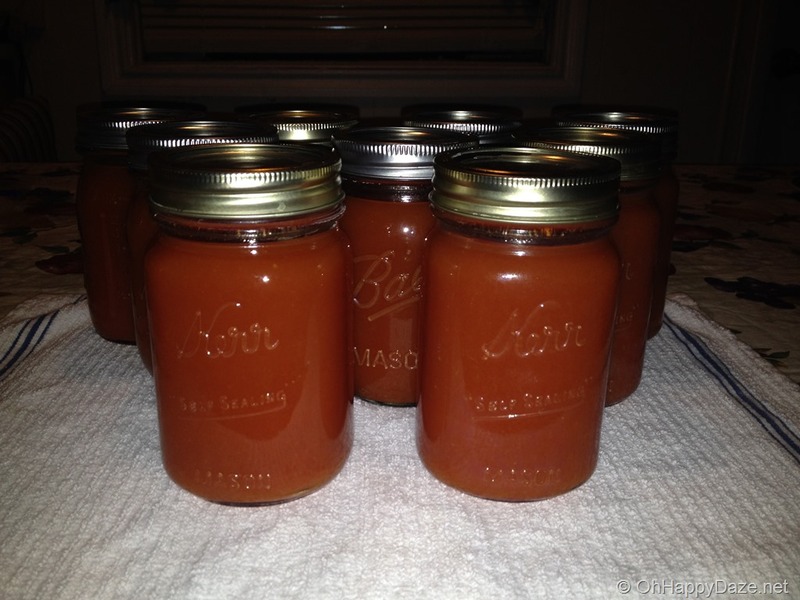 And the TASTE of homegrown homemade sauce is better than anything you can buy from a store!! So, yeah, even for a fairly lazy domestically challenged person that I am, I say it’s worth it! Check out the great products I talked about in my blog on my “Homesteading” section of my aStore at Amazon.com!!! 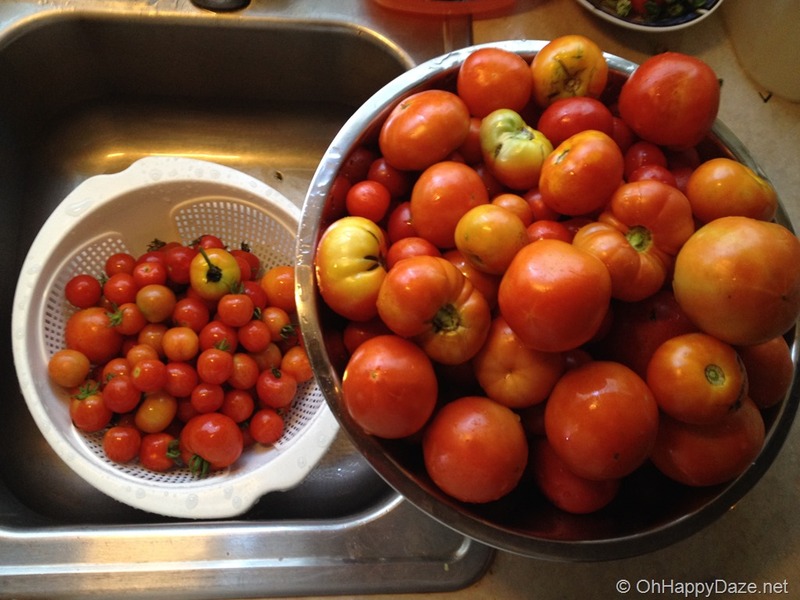 Posted on July 24, 2014, in Homesteading, In The Kitchen and tagged Tomatoes. Bookmark the permalink. Leave a comment.